Here are a couple of Fairies I am working on I will be listing them on ebay when they are done and I get my new template done. These are a lot of work and I feel I have soooo much room for improvement. I'll keep trying though. They are amazing, so beautiful. 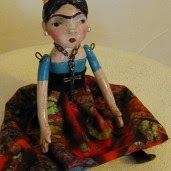 Nancye you make the most beautiful dolls ever! These are no exception. WOW! I love their little faces.... you are so busy! Nancye it is so good to see you working and creating your wonderful and beautiful magic. Have a great weekend! Nancye, these fairies are awesome!They look as if they could start speaking to you. I LOVE them; they are beautiful. You DO make the most gorgeous dolls! She is beautiful! You inspire me. Beautiful Nancy! You are a wonderful artist and I love seeing your creations!